Situated in the heart of the Clwydian Range Area of Outstanding Natural Beauty, Meg's Loft provides high quality, cosy accommodation with stunning views across adjoining farmland. Located on the edge of the village of Llanarmon yn Ial, the home of CBBC's Rocket Island, it is an ideal base for walking and cycling. Coed Llandegla, Coed y Brenin and Penmachno MTB Trail centres are all in easy reach with Offa's Dyke Trail also passing close by. The village of Llanarmon yn Ial offers a shop and popular pub, serving excellent food and real ales. The market town's of Ruthin, Mold and Llangollen are all close by with Snowdonia National Park, the North Wales Coast and Chester all in easy reach. 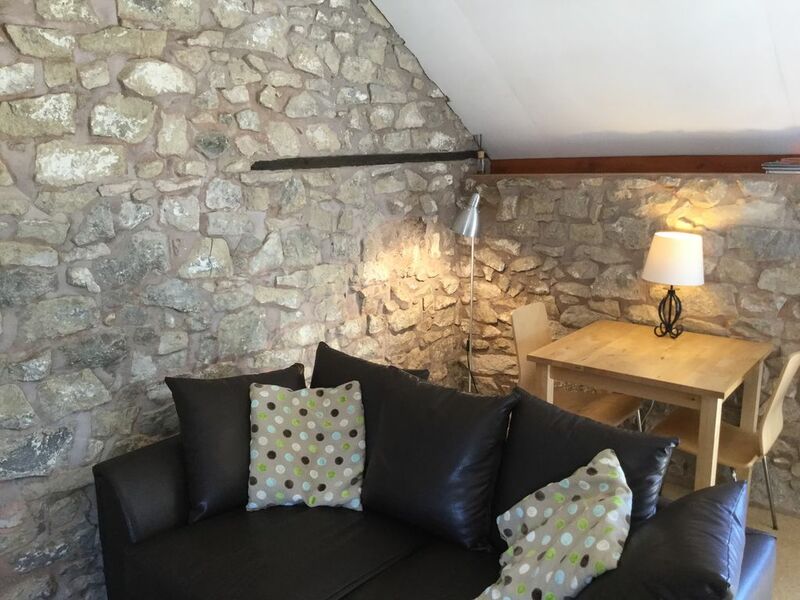 Meg's Loft is located in the converted upper floor of the former coach house with adjoining farmland on the doorstep. The loft is fully equipped with central heating and is ideal for short breaks and holidays all year round. The Loft is ideal for 2/3 people, with a sofa bed providing extra sleeping space to the double room. The location is stunning with views of the surrounding farmland and hills. Ideally situated for walking, biking or enjoying all that North Wales has to offer. The loft is fully equipped offering holidays and short breaks all year round. The lounge and kitchen is one open plan room. A sofa and dining area is provided. TV, DVD and WiFi access. Hob, fridge, toaster, combination microwave Washing machine and tumble dryer is available on site. There is a range of golf courses within easy reach. Notes on accommodation: Washing Machine and Tumble Dryer is available in adjoining building. Bike storage is available Outside: The property benefits from a small decking area with outdoor furniture. Cleaning / Towels / Linen / Maid service: Towels and linen provided. There is no maid service during stays. This is a beautiful loft that accommodates two people beautifully and four with ease. The loft is extremely well appointed with everything you need for a self catering holiday. Thank you for the milk Anna as I always forget to pack it. Our hosts Richard and Anna are so approachable and down to earth. I can only recommend this sweet little loft ! A pleasure to have another stay at Meg's Loft. Small, but perfectly formed and everything you would need for a quiet break in the Welsh countryside. An excellent pub (with fabulous food) and community-run shop nearby for any necessities. Anna and Richard are superb hosts. Would definitely recommend and visit again. Lovely accomodation with fabulous views over the countryside. We booked Meg's Loft for a short break in May and had a lovely relaxing stay. The flat had everything we needed and was fully equipped. We made the most of the beautiful views and countryside and the location is perfect for exploring North Wales. The owners were friendly and helpful and were available to answer any questions and give advice. We had such a lovely time, we have booked another visit so would highly recommend it. We stayed for 11 days and had a great time visiting castles, ruined abbeys, exploring charming ,market towns and going on local walks around Llanarmon yn Ial, which has everything you could desire - a well stocked community shop, community pub serving hot meals, a castle mound, a pilgrim's church and a paleolithic era cave. The flat is detached from the main farm building and the owners were helpful and friendly when we needed advice etc. I heartily recommend a stay. Helpful friendly owners. Nice accommodation on the edge of the village. Ideal for a couple. Handy for lovely walks e.g. Offa's Dyke Path. Fab view from the property. Community-run pub within 5 minutes walk - wonderful atmosphere and good food. Megs Loft is wonderful and modern. The owners Richard and Anna are helpful and very nice. It was very good there. We enjoyed our holidays. All is recommendable. Best wishes and we hope to come back to Nortwales another year. Family Hentschke. The north Wales coast is around a 45 minute drive away. The nearest airport is Liverpool approx. 45 minute drive away. Chester Railway Station 30 minutes. A car is recommended when staying at Megs Loft. Megs Loft is located on the edge of the village of Llanarmon yn Ial. The village has an excellent shop and pub which serves food. The local towns of Mold and Ruthin both have a range of restaurants and pubs to choose from. They also have several banks and supermarkets. The local area is superb for walking and cycling with Offa's Dyke National Trail passing by. Several MTB centres are in easy reach with Coed Llandegla only a 10 minutes drive away. A range of outdoor pursuits are also available near by. Booking Notes: Nightly prices are for 1 night stays, reduced rates for 2/3/4 night stays. Please contact. Please check the availability and then email to confirm your dates. We require a booking form and 50% deposit to secure the booking. The balance is due 10 weeks before your date of arrival. Changeover Day: Our standard change over day is Friday, however we accept short breaks and are flexible with our bookings. Notes on prices: We accept short breaks. For prices please email.